The Hydro is powered by water that is drawn from the Ribble immediately above the weir. 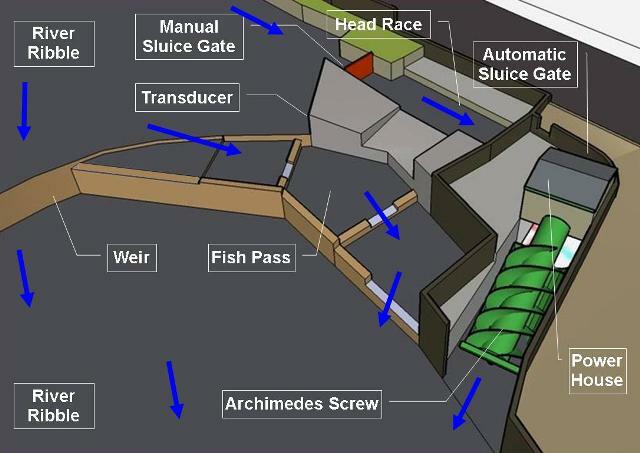 The water flows through a manual sluice gate, along the mill's original head race, through an automatic sluice gate, down the Archimedes Screw (the turbine!) and back into the Ribble. The falling water causing the Archimedes Screw turbine to rotate which, in turn, spins a generator and electricity is created. The electricity is fed by a direct line to the old mill building which now houses a number of apartments. Electricity that is not needed by the apartments is fed into the National Grid. The Society's money is earned from the electricity supplied to the apartments and the National Grid. Money is also earned from the Feed-in-Tariff (FIT), a government scheme that pays the Society for every unit of renewable energy generated. It is a condition of our Abstraction Licence (issued by the Environment Agency) that we stop abstracting water when the amount of water flowing down the Fish Pass falls below a specified limit. This restriction is necessary as the Salmon and Sea Trout that migrate up and down the river find it difficult to negotiate the Fish Pass when the flow is too low. A transducer (measuring device) located close to the upstream entry to the Fish Pass, continually monitors the river level and when it falls below a specified limit, signals the Automatic Sluice Gate to close thus bringing the Archimedes Screw to a halt. When the river level subsequently rises above a specified limit, the Automatic Sluice Gate opens, the Screw starts turning and electricity is generated once more.